From the wiki: “Nigatsu-dō (‘The Hall of the Second Month’) is one of the important structures of Tōdai-ji, a temple in Nara, Japan. 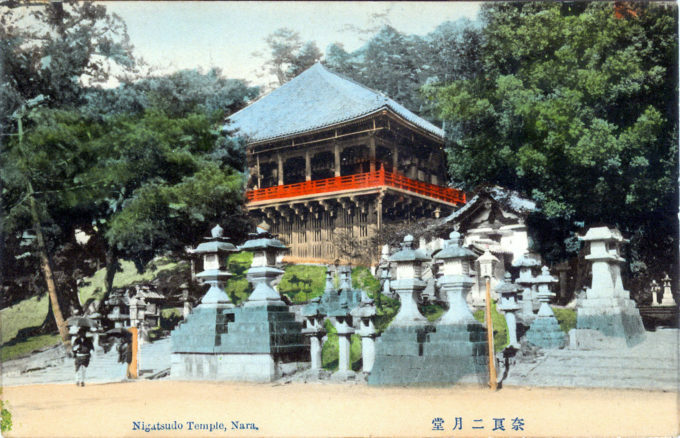 Nigatsu-dō is located to the east of the Great Buddha Hall, on the hillside of Mount Wakakusa. It includes several other buildings in addition to the specific hall named Nigatsu-dō. “Nigatsu-dō was founded by a monk by the name of Sanetada in 752, but the Buddhist monk Jitchu, a pupil of Rōben, later introduced a repentance service dedicated to the image of the eleven-faced Bodhisattva, Kannon in 760. It has taken place as an annual rite since 760, known as Shuni-e (lit. ‘Second-Month Service’), without any break. At present, it starts on 1 March and ends on the 15th of the month.